With Kaladesh spoilers starting to come in, it’s about that time again for my quarterly voice of reason article. Even though we know better, there’s something about spoilers that causes us to throw all our inhibitions to the wind, drizzle ourselves in chocolate sauce and run around on the beach without a care in the world. Maybe I’m speaking from experience, maybe not, but we’ve all been there. Card A gets spoiled, which pairs oh-so-nicely with Card B printed 10 years ago, so naturally we throw them in a deck with 67 other less-important cards and wonder why we’re losing matches. Welcome back to spoiler season. Enemy fastlands just got spoiled, and for many of you, the gears are working overdrive, dreaming up new archetypes made possible by stars-aligned mana gifted to you by the gods of R&D. While it certainly is possible Blooming Marsh might have a strong impact on the Modern metagame, I’m not going to jump for joy until it passes my Context Test. This week, it might seem like I’m the bad guy, or the fun police, but hopefully my explanation of my new card analysis process will help keep you grounded as new cards are spoiled in the coming weeks. Let’s break it down. When a new card/cards are spoiled, the first step is always, always, to establish context. I’ve spoken at length about context in Modern, (it’s kind of my thing), so feel free to take a look through some of my past writings on the topic. (If you don’t want to click away don’t worry, I’ll be talking at length about the theory here). Part 1 of this article will focus exclusively on the concept of context, and how we can apply it towards gaining an understanding of the metagame to gain an edge in event preparation. Part 2 will build on Part 1 by taking the same concept and shifting it to evaluating new cards. When I say context, what I’m referring to is what some people colloquially call the “metagame,” but what they really are referring to are the combination of surface conditions and underlying variables at play that combine to manufacture whatever current environment we’re seeing. That sentence sounds suspiciously like a bunch of words about nothing that my architecture professors like to throw at me to make themselves sound smart, so I’ll do what they won’t, and break it down for you. When Magic players refer to the “metagame,” they are often talking about what decks are occupying a large percentage of market share at the moment. In reality, the concept of “metagame” really includes a complex conglomeration of current top archetypes, rising and falling deck strategies, fresh tech and community attitude that all combine to create the environment we play Magic in. At Level 1, most players are only familiar with the current most popular decks, shown as percentage data on “metagame pages” seen across the interwebs on sites like Modern Nexus. This information is accurate, and helpful, but really only tells part of the story. Most players will skim these sites for information looking for a few quick takeaways. Jund is the most played deck, Dredge is falling, RG Breach is rising, Affinity, Infect and Burn are still Top 5, etc. This is perfectly fine, and can help you prepare for an event or inform some sideboard changes if you need quick information at a glance. But, if we’re being completely honest, these metagame charts are inherently flawed, and almost useless for anyone looking to gain an edge. Why is Jund the most played deck? Why is Dredge falling and RG Breach rising? Why do Affinity/Infect/Burn continue to occupy top 5 metagame share when the tools to defeat them have been around for years? The answers to these questions, and questions like them, make up 95% of the information you should be arming yourself with if you’re looking to prepare for an event. That percentage is arbitrary, of course, but the point remains: most of the “real” information you need to succeed can’t be found on an MTG website’s metagame snapshot, because that information A) isn’t quantifiable and B) doesn’t package well to translate to readers looking to gain a quick edge. Players hunt around for new tech, spend hours dreaming up decklists with new cards thinking they’ll find something that others missed, while meanwhile the tools to succeed are in plain sight, available for anyone willing to put in the work. By the way, I’m not disparaging brewing—in fact, I’ve had more fun (and probably lost more tickets) in the past few weeks battling with a brew than I’ve had in months of grinding with Grixis Control, or any number of the current top decks. We play the game to have fun. For some, that means doing the best they can at the highest level of competitive play they can possibly reach. For others, it’s solving the puzzle of making bad cards do good things, or creating the coolest in-game scenarios possible. For me, I enjoy every approach, but really my main goal in Magic is to know. When a deck wins a Grand Prix, I want to know why. When I go 0-5 with a top deck in a Modern League when I went 5-0 with it last week, I want to know why. So, what’s the process? Hold on, I just bashed metagame charts three paragraphs ago! What gives?! While inherently flawed and dangerous to trust blindly, metagame charts nevertheless still contain accurate, useful data to analyze. If our goal is to gain familiarity and knowledge, our best course of action is to gain a broad understanding of the overall conditions we’re looking at, before analyzing specifics to gain an edge. Metagame charts won’t tell us why certain decks are doing better than others, but they will give us a general sense of the current state of the field and what decks are relatively putting up strong results. Most players skim decklist results for spicy starting 60s to copy card for card, when really the sideboards more often than not contain all the relevant information. Whether a deck is playing Blood Moon or not, how many copies of Stony Silence are present, is graveyard hate plentiful or non-existent—the answers to all these questions can give us much more insight than some top pro’s starting 60. What type of decks are performing? In a midrange-dominated, removal-heavy field, fast combo’s value starts to go up. In a linear, hyper aggressive format, slow combo or clunky control might not be the best option. This is where things start to get murky, as we have to start placing weight to the assumptions we are generating. The three top decks might be Jund, Infect and Dredge, with the next tier primarily aggro. That looks to me like an aggressive field, but what if the second tier is all aggro, while the top tier is nothing but midrange decks? Is the field aggressive, or removal-heavy? We’re fully into theoretical territory here, as almost all concrete evidence has been exhausted, and we need to start pursuing theories. If the field is aggro-heavy; Dredge is performing well because of this; most players are packing Rest in Peace to fight Dredge; and they are cutting Affinity hate to do so, maybe playing Affinity is a good option. Or maybe most players are anticipating that move, so really what I want to do is play Dredge and either have a plan for/dodge the hate? Everyone gets to Step Four at some point in their pre-event preparation, but the difference is how organized and thorough they were with Steps 1-3. Reading articles and theorycrafting about Level 0 and Level 1 deck responses to last week’s event winners really should only happen in Step Four, after a general understanding of metagame conditions has been gained. You should be in fine shape when you can look at a combination of metagame percentages and sideboard cards and be able to construct a sentence like, “Jund is performing well because Dredge is getting hated out of an aggro-defined field, so in theory a consistent combo deck like RG Breach that dodges Dredge hate and simultaneously does well against the aggressive decks and the midrange decks preying on the aggressive decks should be a good choice this weekend…” And all the ladies will be impressed. We’ve impressed all of the ladies, and we’re ready to coolly, calmly view new spoilers with a critical, analytical eye. We pull up our spoiler site of choice, feast our eyes upon new enemy fastlands in Modern and panic!!!!!! New spoilers are exciting for me, but probably not for the same reasons as they are exciting for you. I don’t play Standard, and don’t pay much attention to Standard, so when it comes to evaluating new cards for Standard all I have to go off of is my analysis of the card on rate alone. I couldn’t tell you one thing about Standard, other than that I know Collected Company is nuts because of Twitter and Eldrazi is unfair because of my dad. As a result, when spoilers come out I get to log my opinions of the cards based on rate alone, and then see if they show up in Standard once they’ve been put through the Context Test. Liliana, the Last Hope on rate alone doesn’t hold a candle to Liliana of the Veil, so unless she sets up some excellent synergies I can feel confident she won’t see much play in Modern. As for Standard, context is everything. If creatures are similarly sized to where -2/-1 is affecting a large percentage of boards, if there are a lot of x/1’s she can kill, if her minus ability has synergistic power in the format, I can definitely expect her to see lots of play. For new cards like the enemy fastlands, we’re starting at a disadvantage as we don’t have much (read: any) concrete data to analyze. Basically everything is theory, which is why you get scenarios where almost everyone maligned Jace, Vryn’s Prodigy until he went on to dominate Standard and heavily impact Modern, or Nahiri, the Harbinger looked underwhelming at first but grew to sponsor whole archetypes helped up just by the contextual power of one card. Still, we can apply the above model towards new card analysis, as long as we realize things might look different. I thought things were going to look different!? Again, they’ve done the work for us, it makes no sense to start from square one. New cards coming into eternal formats always have to answer one basic question: “What are they bringing to an already established format?” Unless said new card is completely broken on rate alone (looking at you, Treasure Cruise), it will almost always slot into an existing deck rather than sponsoring a new archetype by itself. Yes, corner cases exist, but these are most often combo decks (Death’s Shadow Zoo getting Become Immense, Living End getting Living End, Retreat Combo getting Retreat to Coralhelm). For everything else, we need to gain an understanding of what decks are currently being played in Modern, and whether said new card fits into any of these decks by either A) supplanting an older, less powerful option; or B) providing a new threat or shoring up an old weakness. Evaluating new cards based on both rate and synergy, and then pairing them with a pre-existing card pool can help create a new archetype “out of nothing.” I put this in quotations because in almost all cases most of the tools for the archetype already existed in the format, they just needed a bit more push to cross over into playable range. Think Collected Company for Elves, or Nahiri, the Harbinger for Jeskai. To have an actual impact in the format, the new card must provide enough power for the deck to compete where it wasn’t able to before, or provide in some other fashion an irreplaceable effect that the deck was missing previously. Judge’s Familiar isn’t integral to Merfolk’s success, while Master of Waves is. This makes sense to us on our side of history, but this is the most common pitfall players fall into when looking at spoilers. Some white toolbox creature with a neat effect that pairs synergistically with White Weenie gets printed, and players point to it as the final piece of the puzzle that will push White Weenie into relevance. In reality, that creature is just providing another similarly powerful effect that a bunch of other cards already provide, where what White Weenie really needs is something insane like Stoneforge Mystic to make it relevant. The card might not slot into an existing archetype, and might not be powerful enough to create a new archetype by itself, but perhaps it will find success as a niche roleplayer or sideboard spell in specific metagames. Virulent Plague isn’t a “good” card, but it popped up in sideboards here and there until Splinter Twin got banned. In an alternate reality where Lingering Souls and Deceiver Exarch copies are running rampant, who knows what would have happened? For me, the fastlands probably won’t make a significant impact in Modern, for a few reasons. Looking at existing decks, consistency in their mana isn’t a determining factor in winning or losing games. Sure, some three-color decks might take a couple extra points against Burn that could swing the matchup a bit away from their favor, but those decks probably could be built to take less damage against Burn/Affinity from their lands if the really wanted to. Even if they couldn’t, it’s still a large stretch to imagine that having access to a specific fastland would really change the matchup around enough to make a significant difference. Looking at Jund, even assuming it wanted to play Blooming Marsh, does it really change anything for the archetype? Say it lets us go Raging Ravine turn one into Blooming Marsh, Thoughtseize, Lightning Bolt turn two against an aggressive deck. This will only matter if both the extra green source and the extra point from not fetching a basic end up making a difference further down the line. It just doesn’t seem impactful. Jund specifically wants Blackcleave Cliffs so it can cast Lightning Bolt and a discard spell on the first turn without having to take three to fetch a shockland. There’s gameflow and deck composition to take into account, and I’m just not sure there’s an archetype in Modern that was really wishing for better mana and if they just had it they would be able to win this matchup that they kept losing. Even black-white decks that might play Concealed Courtyard were often Taxes or Eldrazi decks anyways. Those decks need to play a certain number of Ghost Quarter and other colorless sources, and once you add in the requisite shocks/fetches/basics they often couldn’t even afford to play the full four Shambling Vent. If the fastlands are going to make an impact in Modern, it will be because their existence sponsors a new archetype that wasn’t possible previously due to poor mana. In a fetch/shock format, the mana is good enough that every two-color deck can splash a third color almost for free, thanks to fetchland pairs being off-color once we have more than four. BG Death Cloud is an archetype, but metagame conditions aside Jund is just better and stronger, as it can play Lightning Bolt, Kolaghan’s Command and Raging Ravine basically for free. The new lands are great and they might see play here and there, as Seachrome Coast and Darkslick Shores see play in Ad Nauseam, and Blackcleave Cliffs sees play in Jund. But I don’t anticipate them being “impactful” in the sense that they will change the current context of Modern. Tasseled Dromedary, on the other hand…. For the most part, I agree with you. I don’t think these new lands will be the next KTK fetches. One thing I do want to note is that the red/blue fastland may have a home in Jeskai Nahiri, as it lets you leave up mana for Bolt or Spell Snare without shocking yourself, in the same way Jund can Bolt or discard with Blackcleave Cliffs. This in turn lets you fetch a basic white on turn two and meet all your colors at 19 life. Similarly, I see these as strengthening aggressive two color decks (or decks that only splash a third color) against their aggressive matchups, specifically the RW land in Burn and the UG land in Infect. If this becomes popular, it means the big three aggro-combo decks of the format (Burn, Infect, Affinity) all have a minimally painless manabase to go off of. This might be scary, or it might turn the tide from trying to race them into trying to answer them, allowing for more diversity in the format as answers don’t just stay secondary to faster threats. Outside of this, however, I see somewhat limited use for these lands. Great article! You make good points and I agree with everything you’ve said. I think we most likely will see a situation where a couple decks in the format take on average (over a many game set) 1 or maybe 2 less damage over the course of a game. Whether that shift will be enough to change gameflow within certain matchups is hard to tell, but I think that’s the only “impact” enemy fastlands could sponsor in Modern. I’m with you, Trevor – these lands won’t radically alter Modern’s landscape, but they’ll give some archetypes a couple of points here and there. I’m wagering Concealed Courtyard will give Eldrazi and Taxes a slightly smoother manabase, which may solidify its foothold on Tier 2. Same goes for Grixis Delver and Spirebluff Canal. Botanical Sanctum may or may not find its way into Infect, but I’m thinking it will (and that might help, given that Burn is arguably its worst matchup). I’m not sure if BGx or Living End wants Blooming Marsh (maybe Abzan will? ), but if they do, it’s there. Burn might reach for an Inspiring Vantage or two – Nacatl likes Sacred Foundry, but that’s fetchable, and you won’t compromise your fetch count to jam it in there. Thoughts? I agree, and hopefully I made my position clear in the article that ‘significant impact’ excludes small play in a few archetypes here and there. Blackcleave Cliffs does great things in Jund, but the deck would look relatively the same without it, and probably play out very similar in many matches. Just look to the matches where Jund doesn’t draw Blackcleave; this is how those games will play out were Blackcleave Cliffs not in the format. I’ve yet to find a Jund player lamenting ‘not drawing Blackcleave Cliffs’ as the reason they lost the match. I think we can apply this same thinking to most archetypes across the board; some manabases will get slightly better, which could shift a couple points here and there. I’m looking for significant changes: Burn dropping out of top tier because everyone has much better mana; a deck that couldn’t compete can now do so. I don’t think that will happen, which was the premise of my article. Completely disagree about the fastlqnds, the UR alone will fundamentally change modern. I’m interested to hear your feedback, even more interested to see an example from this ‘huge swath of decks’ that weren’t viable and are now. How will the U/R land fundamentally change Modern? You’ve made some bold claims in two sentences and have my interest! Infect might want a couple fastlands; since you don’t really have any blockers/removal, fetch+ shock can be pretty painful. Along those lines, ur/grixis players without access to scalding tarn for basic mountain in the early turns can use fastlands as a substitute. Aggro is so good in modern because of the inherent painfulness of manabases; any slight upgrade in this department WILL win games from time to time. In some Grixis lists I’ve been known to play two Darkslick Shores, depending on if I’m playing maindeck discard or not. In those decks I’m usually playing Jace, Vryn’s Prodigy, and the ability to dodge Choke with another pseudo-Island like Creeping Tar Pit is helpful in corner scenarios. Darkslick Shores was preferred to Blackcleave Cliffs in those situations because I couldn’t cast Serum Visions T1 off a Blackcleave, but I can definitely see the UR land replacing Darkslick as a way to cast Lightning Bolt on T1 without having to shock (or fetch basic Mountain, as you said). Does this fundamentally shift any matchups, however? Burn can be close depending on if we’re building for it, but I’m not sure the extra two life (not having to shock on T1) to kill a Goblin Guide changes the matchup in any significant manner. This was the premise of the article. I expect to play some number of the UR land in Grixis depending on my configuration, but I don’t expect the change to sponsor any significant shifts in the metagame. IF the enemy fastlands will make an impact in Modern, it will be the UR fastland that makes 90% of that impact. UR/x decks are the core of tempo strategies, that often run close to dead when they win. Getting U and R on the first turn for no loss of life will, as has been mentioned enable the deck’s critical spells on turn 1, just as blackcleave cliffs has done for Jund, and those extra 2-3 points of life are often critically important for tempo decks. I don’t see any of the other lands doing anything extremely important. I find that enemy fastlands will have a small home in modern, but an important one. I see the U/R land seeing play in snapcaster/lightning bolt style decks as a means of casting serum visions or lightning bolt turn one, as well as just giving the deck another decent option for a non-shock dual land. I also think that the U/G land could see some play in infect as an additional blue source that comes into play untapped, though that seems less certain. I think it’s also worth mentioning that for an aggressive tricolor strategy based on enemy colors, fastlands really help the manabase feel better. Specifically, Temur seems like it could benefit from having access to a couple new lands. Blackcleave is the reason you play Jund over Abzan against the field, and while pathing a threat on t1 or during their upkeep isn’t ideal it falls right in line with their removal package and play patterns. Not having to give burn or affinty and additional -3 / -5 in life is huge, those decks no longer get that virtual card advantage they’ve gotten since the dawn of Modern. With concealed courtyard Abzan will become the GBx deck de jour because of the new fastland and collective brutality escalating binning souls. Grixis and Delver have desperately wanted a UR fastland forever, to either play delver bolt or serum or if on the draw hold up bolt/scour. No one is saying burn is going to fall off the map as its a great intro deck for new comers to modern but it will be taking a further step back. Dude that is an excellent point. Not so much which decks these lands buff but the side effect of nerfing burn. I find it funny how I win 3 out of 5 games vs burn or zoo with my budget mono green stompy because of my 23 forests not dealing dmg to me. It’s only 1-3 life points that determine games. It doesn’t seem like much but in a environment like modern that 1 little life point determines games vs burn (which is my main go-to deck in modern). Other than that, infect welcomes the UG land, Abzan like the WB one, UR = painless bolt or serum visions T1, and I for one will be using the BG one in Living End. The UR has to be the best tho. You make good points, and I don’t have extensive experience with both decks personally but have played against both extensively. In my opinion, I disagree that Jund is played ‘because of Blackcleave Cliffs’. Lightning Bolt is much better against most creatures than Path to Exile, Raging Ravine is much preferred to either Shambling Vent or Stirring Wildwood, Kolaghan’s Command is too different from Souls to compare but Souls probably gets the edge, and then there’s Terminate. I think it’s safer to say that Jund is played more due to its efficiency and strength against the field, while Abzan is better against a specific look. 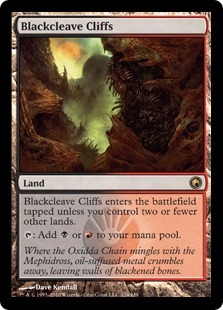 Blackcleave Cliffs does good work in Jund, but by no means does it ‘make the deck’. I can tell you as a Burn player that I’m not at all concerned. The major most popular decks I see taking advantage of these lands are the mirror, Infect, Abzan, Grixis Control and Delver, and Jeskai. We can take the mirror out of the conversation, and Trevor already covered Jund versus Abzan accurately. The rest of the metagame will keep it in check, and I think we’re favored on Abzan regardless from sheer racing ability. Infect and Delver are some of our strongest matchups, and its not because they shock themselves for two at the start of the game. It’s because they rely on protecting a handful of threats, and our deck is made up of kill spells. Our game plan is the same; kill their threat and play the long game with our superior consistency. The major decks I see this having an effect are Grixis Control and, moreso Jeskai Nahiri. I’m not even sure it strengthens Grixis Control that much because they don’t often have the lifegain to take advantage of it, and the deck is in recession right now anyways. Either we race them before they land a Delve threat or we Path to Exile or Deflecting Palm it, or we don’t. The fastland does help them, but not a huge amount. Nahiri Jeskai warrants discussion. They have the Lightning Helixes and Timely Reinforcements to make strong use of saving every bit of life they can from us, and Nahiri is harder for us to answer than a Delve threat. Does this worsen our matchup versus them? Absolutely, and it needs to be accounted for. Is it enough to take Burn off the map? Like I said, I’m not at all concerned. Has anyone else tested the UR fastland in Jeskai control? I am currently testing it replacing Sulfur Falls and (though I’ve only jammed around 20 games) I’m beginning to think it’s viable. The way I see it is: the only time that Sulfur Falls is strictly better than Spirebuff Canal is if it is the 4th land you draw, delaying Nahiri by a whole turn. Jeskai plays relatively easily with 4 lands so the 5th entering tapped is no problem, and Spirebuff comes in untapped even if the rest of your hand is plains and Celestials. Has anyone else got any thoughts/done any tests? I have not tested the switch, but I have played Sulfur Falls in Jeskai/Grixis enough to comment on that card specifically. Sulfur Falls is often great, but can get us into trouble particularly in Jeskai, where we have four Celestial Colonnade and often 2 colorless lands. It doesn’t happen often, but there are hands where we dont have a dual, or need RW on turn 2 for Sulfur Falls and have to fetch to make it happen (either fetching a tapped shock on turn one when we’d rather play Colonnade, or playing Colonnade and have to fetch a basic or shock later). Doesn’t happen often, but enough that it has made an impression. Now, in those situations would we rather exchange the possibility of awkwardness in the early turns for a 5th-6th land that comes in tapped in the midgame? I think if we’re living to turn 5/6 we’re often fine anyways, so I’m leaning towards moving away from Sulfur Falls. Still, there is an opportunity cost there we have to keep in mind. As a burn player (have been for a few years), the needy fast lands do impact us a little bit. It can sometimes come down to 1-3 life. However, most people still don’t know how to play against burn. We punish any reckless fetching. A true burn player won’t be affected much by these lands honestly. Most matchup that these lands will help were already in our hands anyway, like infect, IMO. That’s just my 2 cents, anyway.